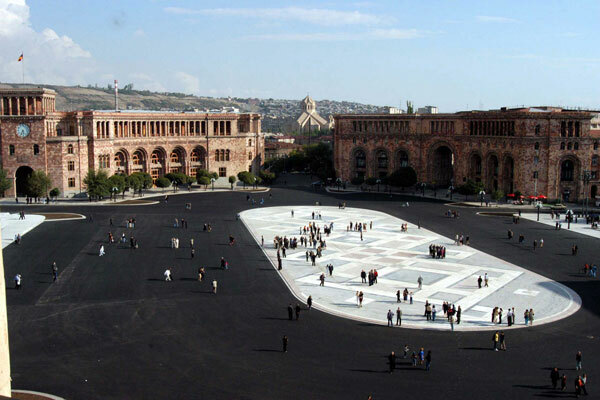 Republic Square is really a traffic oval, centerpiece of Alexander Tamanian's 1920's master plan for Yerevan. 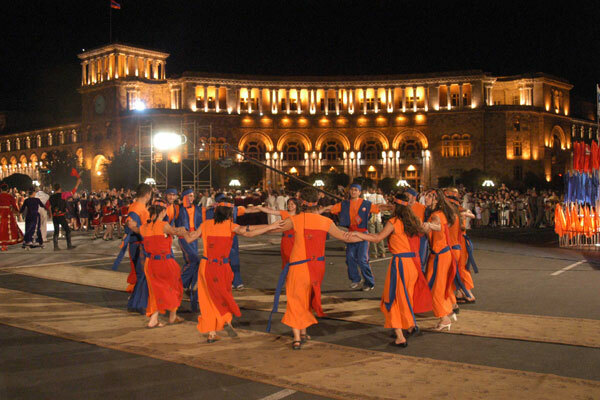 Republic Square is the center of Yerevan for government offices (the real heart of the city is at Opera Plaza). It was once called Lenin Square, and had an incredibly large Lenin Statue, dismantled in 1990. The pedestal for the statue was removed in late 1996, replaced with the current stretch of grass. Now completely demolished, the enormous statue (1940, sculptor S. Merkurov) lay in several pieces in the History Museum courtyard until it suddenly disappeared in 1996 (some say sold to a New York dealer, Vasilis head adorning a disco). The statue was considered one of the best examples of Soviet Art, and the demolition of the pedestal was vociferously protested against, widely regarded as one of the best stone sculptures in Armenia, despite its subject. Tamanian's square includes five imposing structures, built between the 1920s and 1950s: the Post Office (1950) on the right has a striking stained glass window behind the postal counter, a café, but limited postal service. You can still buy kitsch postcards at the counter. To your upper left is a government building - Ministry of Foreign Affairs, with the popular Noyan Tapan bookstore (maps, postcards and calendars) on ground level. 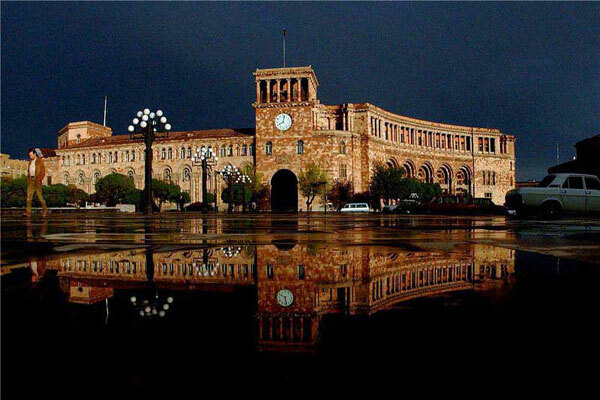 The government building with the clock tower (1926-1940) was built under Tamanians supervision. The building combines classical lines with Armenian details in the capitals and along the top frieze. The sheer mass of the building is lightened through brown and cream colored tuf stone. Directly across the square are the State History Museum and National Art Museums (1926-1950). The white facade and colonnade is a pure symmetrical design. The lower levels house the History Museum with the largest prehistoric and Asia Minor collection of artifacts in the world, while the upper level was added later to house the Art Museum collection which includes Rembrandt, Titian and—together with the Russian Art Museum by Cascade—the second largest collection of 19th Century Russian Art in the world. In the back of the building are the Literature and Art and the Middle Eastern/Marcos Grigorian Museums. In front are the Singing Fountains, a popular spot for evening strollers and open air concerts. From Republic Square you enter contemporary Abovian Street, left of the Museum Building. The first few blocks most closely resemble Old Abovian (Astafian) as it was at the turn of the century. Two rival architects shaped the quarters ambiance, their buildings on opposite sides of the street; on the right are the Neo-Classics favored by V. Mirzorian, and on the left Art Nouveaus by B. Meghrabian.